Globe Electric 43529 18 Inch Sleek Outdoor Wall Lantern, Black Finish With Clear Glass Shade. Welcome your guests in style with this sleek outdoor light fixture! All mounting hardware included for quick and easy installation. Weather resistant, constructed of die-cast aluminum, this outdoor wall mount is ideal for illuminating the entrance and outside of your home. Requires three 40 Watt B10 light bulb (sold separately). Enjoy high end exterior decor to your home with this 9.5 in. 2-Light Outdoor Decorative Water Glass Lantern LED with Fixed Flame Tip. Aluminum construction provides extra durability while the oil rubbed bronze finish provides that classic rustic look. The water glass accents give an antique feel while providing all around illumination for porch areas. No replacement bulbs necessary, this 2-Light Outdoor Decorative LED lantern light sources are rated at 25,000 hours or 22.8 years based on 3 hours/day of use ensuring you and your family beautify exterior lighting for years to come. 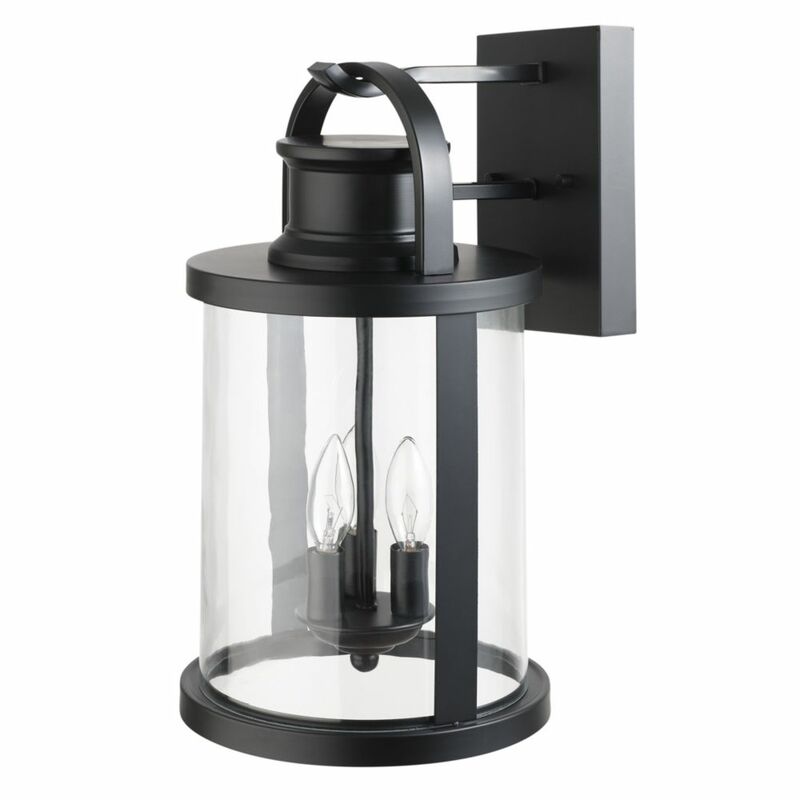 This Hampton Bay 16.5-inch outdoor wall lantern features a solid black finish and eight sides of clear, beveled glass. This simple, elegant design compliments any exterior decor. These fixtures are built with cast aluminum to last, and they are suitable for use in wet locations. Update your outdoor space with the Hampton Bay Mission Style Exterior Wall Lantern with Built-in GFCI electrical outlet for power outdoors where you need it. Constructed of rust proof aluminum, seeded glass panels and painted black with bronze highlights, this lantern will give your outdoor space light, ambiance and electrical power. Use this Hampton Bay lantern to bring rustic simplicity to your space. This lantern combines pearl mission glass panels with arts and crafts styling. Rugged die-cast aluminum housing makes this lantern ideal for outdoor installation. 43529 18 Inch Sleek Outdoor Wall Lantern, Black Finish With Clear Glass Shade Globe Electric 43529 18 Inch Sleek Outdoor Wall Lantern, Black Finish With Clear Glass Shade. Welcome your guests in style with this sleek outdoor light fixture! All mounting hardware included for quick and easy installation. Weather resistant, constructed of die-cast aluminum, this outdoor wall mount is ideal for illuminating the entrance and outside of your home. Requires three 40 Watt B10 light bulb (sold separately). 43529 18 Inch Sleek Outdoor Wall Lantern, Black Finish With Clear Glass Shade is rated 3.0 out of 5 by 1. Rated 3 out of 5 by Linda from Great looking but poor condition upon receipt Ordered three of these but two were broken upon receipt. Home Depot refunded purchase price but now I'm unable to place second order to replace my original order so VERY disappointing. Either better packaging or better handling during shipping might resolve the issue?